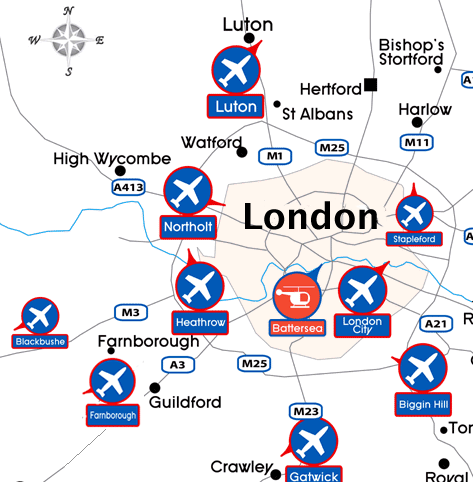 We are able to offer Helicopter transfers between London Battersea Heliport and Farnborough Airport, London Heathrow, Gatwick Airport, Stanstead, Biggin Hill, Shoreham, Southend, London Luton, Birmingham and Manchester.Arriving in the UK and needing to transfer to London is fast and simple with us, please see below for journey times. With a diverse fleet of Helicopters able to carry from 1 to 15 people in a single aircraft and close links with London and other airports we are best placed helicopter charter transfers to or from any airport to London Heliport. We are even able to position the helicopter next to your private jet for your convenience. Call us on the numbers above for assistance.